Another bodybuilder to appear on the UK in 1980 was Padane with their ZX model. This was another coachbuilder to quickly fail, only selling ten coaches of which Trathens took nine. The odd one was XPP289X on a Tiger chassis for Ensign, Grays although IIRC Ensign was also the importer. 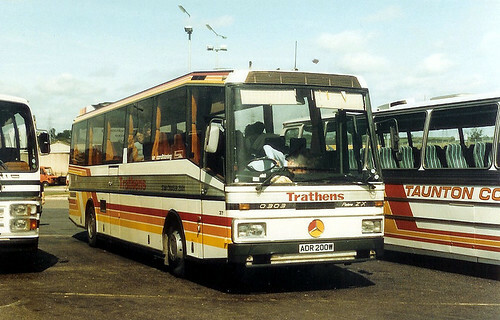 Trathens had ADR 200W and NFJ369W on Mercedes 0303 chassis followed in 1982 by ADV 142-6, 157/9Y on Volvo B10M. Mercedes 0303 ADR 200W is seen here at Exeter Services in August 1984.